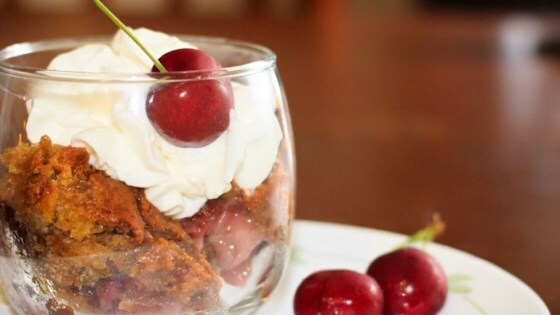 "This is a delicious cherry cobbler made with fresh cherries instead of canned. It may take a little longer to make because you need to pit the cherries, but it is well worth it when you taste the finished product." Preheat the oven to 350 degrees F (175 degrees C). Place the butter in a 9x13 inch baking dish, and place in the oven to melt while the oven is preheating. Remove as soon as butter has melted, about 5 minutes. Bake for 50 to 60 minutes in the preheated oven, until golden brown. A toothpick inserted into the cobber should come out clean.